Ever wondered what makes a writer tick? 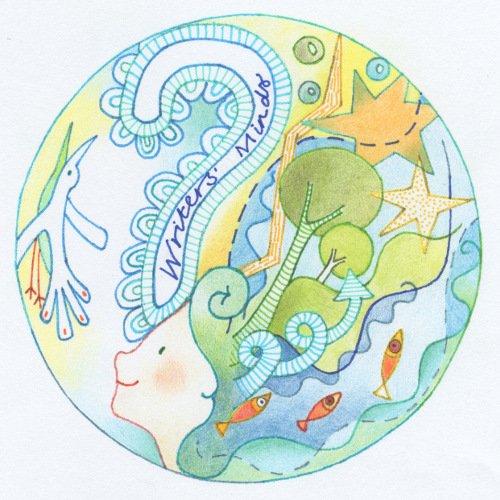 What cogs of creativity whirr to bring stories to life? We take a peek into the minds behind the craft and probe for creative rituals, routines and inspiration hunting. 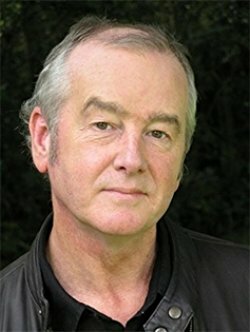 This month I had to pinch myself and have a stiff cup of tea after interviewing the one, the only, David Almond! We all know of David’s incredible award winning career - book after book received to critical acclaim. 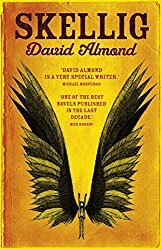 But…did you know that DAVID ALMOND will be a keynote at this year’s SCBWI BI Conference in Winchester 19th – 20th November? I found David truly inspirational giving this interview – imagine what he’ll be like at the conference! If you haven’t booked your ticket – follow this link and be ready to be inspired. Booked your ticket? Good. Then grab a cuppa and hold on to your hat for our quick fire questions. Let’s dive inside this writer’s mind. David Almond, are you ready? Bit of both really. I go out and wander about and stare at things a lot, picking up stuff from the world around me. But I also pick up things over the years. You’re never sure how some things are going to work but then they catch you eye and accumulate in your mind. You can find yourself writing about something and you don’t know why you’re doing it and then think – oh yeah that comes from this thing I did five or six years ago. But a lot of it is subconscious. So much of the process is to allow the subconscious to set to work and do its thing. "...write in the spirit of hope and expectation." I don’t plot. I can’t plot. I’ve tried plotting. If I give myself a plot, with the complications, the story starts to go where it wants to go. Stories tend to grow organically. Like a living thing, you’re never quite sure where it’s going to go, how it will grow. Sometimes it feels like I’m a bit of a Pantser – thinking what the hell am I doing? And it can feel insecure. But you write in the spirit of hope and expectation. I tend to discover things as I go along. But you have to make it work, tend to it. I’m constantly revising. Re-write. Re-write. Re-write. All the time. Get the sound of it right. Get the shape of it right. Re-write. I used to be a shed sitter, but I got very cold. In the middle of December in a shed was not the best place to be. Wearing a hat and a coat and a scarf at about minus ten outside (it was a cold winter). I was even wearing fingerless gloves and thinking, this is crackers. It’s useful to be able to feel your fingers. So then I began to go to a library; a lovely warm Georgian library in Newcastle that had people and coffee. "Be Brave. Go Further Than You Think..."
Sometimes I surround myself with images and objects from a particular book. 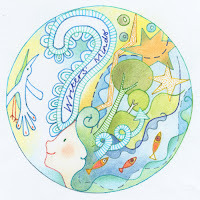 For example, when I was writing My Name is Mina I’d collect bird’s nest and feathers, with little quotes from Mina scattered all over the place. I used to have phrases like ‘Be Brave’ and ‘Go Further Than You Think You Can’ above my desk. I had one on the door to my office and it just said, ‘Go back!’. So when I’d think, I can’t do this, I’m getting out of here, I’d see the sign that said – Go back! The early stages of writing a novel tends to be more scattered, but once it’s going, once I’m in the meat of writing a novel then I tend to do a thousand words a day. I get very organised and I draw up charts and see how many words I do each day, then add up how much I’ve done at the end of the week. "Writing ... is a physical act." I love notebooks, pencils and pens. I love scribbling and all the tools and toys available to us. But I don’t hand write the manuscripts. When I get stuck, I get out the blank page notebooks. There’s something quite physical about using the arm, using the hand. Pencil on paper releases something that can’t be released straight onto the screen. Writing is not just to do with the brain, it’s a physical act. Silence. I try music but every time, I think, nah – turn it off. Even music that I love, I can’t do it. I have listened to Arvo Part and that seemed to not interfere too much. There was something about him that helps you to get into that Zone. I cannot drink when I’m writing. Even if at lunch time I have a smidgen of alcohol, that’s the day finished for writing. A nibble of chocolate helps a writer, but apples and tea, they're for me. Both. It’s bringing the two together. Opening up the mind and allowing it to bring all kinds of weird and whacky ideas, but then working hard, banging away and not giving up. You have to keep going and have a thick skin. It’s the two together. It has to be. I don’t really, but I am conscious that I do a lot of fiddling about before I settle down to write. It might be doing a bit of doodling. I’ve just bought myself a set of lovely coloured pencils, so sketching around, allowing the mind to open, it helps you get to that focus, to that place. And then you start. Yes, I do. Sometimes I can tell when a novel needs to be written because the characters keep chattering away at the back of my head, my turn, my turn! I’ll wake up thinking about a novel or a particular character. The two voices that were strongest talking in my head was Mina, from My Name is Mina and Billy from The True Tale of the Monster Billy Dean. Billy just wouldn’t shut up! "Be Imperfect. Accept your imperfections." If there’s one key piece of advice, one gem of wisdom about the craft of writing, be it character development, re-writing or plot vs story, what would that be? Sit down and do it. Don’t be scared. Don’t be put off by all the great books. Be imperfect. Accept your imperfections. If you were perfect, you wouldn’t have to write. 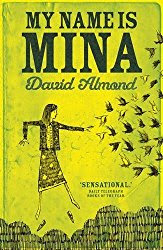 David Almond is the author of Skellig, My Name is Mina, The Savage, The Tightrope Walkers, A Song for Ella Grey and many other novels, stories and plays. His work is translated into over 40 languages and is widely adapted for stage and screen. 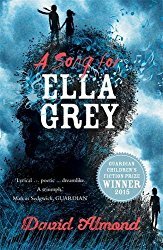 His major awards include The Carnegie Medal, two Whitbreads, The Michael L Printz Award, Le Prix Sorcieres, The Eleanor Farjeon Award and the Guardian Children's Fiction Prize. In 2010 he received the Hans Christian Andersen Award, the world's most prestigious prize for children's authors. His innovative, boundary-breaking work is loved by readers of all ages, and receives widespread critical acclaim. He is Professor of Creative Writing at Bath Spa University. He lives in Northumberland. Lou Minns writes MG & YA. She loves the process of critique and getting to the beating heart of the story. Lou has been lucky enough to live in Sydney and California before returning to the UK in 2016. She has made lifelong friends through SCBWI and if they each stretch their arms wide enough; their fingers might just touch as they span the globe. Great advice from David Almond. Well done Lou. A lovely morning read to wake up the creative juices. Skellig is one of my favourites. Thank you to David Almond and Louise for this great interview. I'm looking forward to the festival even more now! He totally makes you want to pick up a pen and write, doesn't he? Feeling inspired and looking forward to the conference! What a wonderful interview, thanks for sharing. In fact, I was equally as inspired by a vlog that David Almond had done where he talked about his need for filling notebooks and being very messy and creative in the beginning - it was very re-assuring as I often work in this way to start with and I had been really struggling using apps on my ipad! Writer always write those thing in his story who people liked him because he want write successful words for every one thanks for share it paper in revision.